Issue Summary: Earth’s climate is changing. The local effects of climate change are diverse and include rising sea levels, ocean warming and acidification, changes in winter storm frequency and intensity, changes in timing and quantity of precipitation and potential changes in the timing, intensity and frequency of coastal upwelling. While estimates of change remain frustratingly imprecise, there is little doubt that Pacific Northwest communities, including those on Oregon’s south coast, are already being affected and will continue to be affected for many years. Why do we care: Climate change has the potential to affect the Partnership’s “triple bottom line” of community, economy and environment. Local effects over time are likely to occur in our commercial and recreational fisheries, water quality and quantity, developed and undeveloped shorelines, tourism, timber production, and other resource-based businesses. A wise response to these potential changes would be to anticipate them as best we can and to respond as needed to unacceptable changes. Climate change is a global phenomenon: new analyses of ice cores in Antarctica to front porch observations in America’s towns, it’s becoming apparent that our world is rapidly changing. Although numerous knowledge gaps impair our understanding of the full breadth of challenges, the technology enabling observation and quantification of environmental variables associated with climate change is improving dramatically. The accompanying new knowledge, combined with ongoing observations, is telling: changes in meteorological and nearshore ocean conditions are escalating and intensifying (Graham et al. 2001, Allan and Komar 2006). As a result of this increased knowledge, communities around the world are evaluating their exposures and adapting to potential risks. Changes include rising sea levels, increasing storm strength and frequency, and increasing air and water temperatures. These changes trigger increases in significant wave heights, storm-driven inundation and erosion of coastlines, and damage to coastal infrastructure and personal property. Scientists and resource managers are teaming together to understand relationships and effects among variables worldwide, and making comparisons of historical observations with those of the present day in an effort to better understand these changes, including already observable changes and predicted changes. The Pacific Northwest coast is leading this change. Parts of our coastline are experiencing higher rates of sea level rise relative to many other parts of the globe, due in part to highly active plate tectonics (Komar et al., in press). While rates of uplift in some of the Pacific Northwest’s coastal zones have kept pace so far with the rate of sea level rise, other locations are increasingly experiencing the intensifying effects of storms, erosion, and inundation that worsen the local effects of sea level rise. Contributing to these interactions is the proximity of the Pacific coast to deep offshore waters and the upwelling that has always played an integral role in our coastal ecology and weather. Additionally, the occurrence of El Niño events (see explanation below), while nothing new to this area, have had increasingly intense effects in conjunction with rising sea levels in recent decades (OCCRI 2010). In Oregon, efforts by the scientific community to quantify the local effects of climate change have recently been documented and discussed in the “Oregon Climate Assessment Report” by the Oregon Climate Change Research Institute (OCCRI). The Institute is comprised of more than 100 researchers affiliated with Oregon‘s universities and its state and federal agencies. Their comprehensive report details not only the present state of knowledge (as of 2010) regarding measurable effects of climate change on Oregon’s coast, but also effects as diverse as the projected future water supplies for cities and agriculture, wildfire intensity, changing geographical distributions of indigenous and non-native plants and animals, and the many associated ripple effects on the state’s economy. Observations and generalizations about climate change effects on the ecology and economy of Oregon and the Pacific Northwest have varying degrees of uncertainty; scaling these effects down to smaller scale geographies such as that represented by Oregon’s South Coast region further increases uncertainty. At present, there is no local-scale modeling of processes affecting this region (such as upwelling, coastal fog, etc. ), and attempts to deduce local-scale change from large-scale models, many already rife with uncertainty, can be hazardous. However, the OCCRI report documents and describes changes to communities and coastlines (and includes a case study of Neskowin, Oregon), and provides reasonable scenarios for changes slated for this dynamic coast. Armed with such knowledge and aware of the caveats, residents and managers alike can look ahead and prepare for change. The remainder of this section summarizes the OCCRI report (OCCRI 2010), and, whenever possible, south coast-specific projections are detailed and inferred. Sea Level Rise The average rate of sea level rise along the southern coast of Oregon, as elsewhere in the Pacific Northwest, is higher regionally than the global average: approximately 2.3 mm/year versus the global 20th century average of 1.7 mm/year. These rates are derived from tide gauge records in use for more than 100 years, and the increases correlate with a global reduction in ice cover and increases in temperature of water and air. A major reason for the Pacific Northwest’s accelerated rate is the interactive effect of regional tectonics, where uplift along much of this coast is slower than the rate of sea level rise, and some sections of coast are sinking. In contrast, uplift along much of the northern California coast is outpacing sea level rise. On the southern Oregon Coast, regional variability in tectonics has contributed to the variability shown in sea level rise in Figure 1 (from OCCRI 2010). By mid-21st century, the rate of sea level rise in the Pacific Northwest is expected to have surpassed tectonic uplift, and associated effects are expected to escalate as well. Figure 1. Rates of sea level rise along the Pacific Northwest coast (OCCRI 2010). Storms are a common occurrence along the Oregon coast, and the waves generated during winter storms are a significant factor in shoreline dynamics. There is evidence that storm intensities (as measured by atmospheric pressure and wind velocity) have increased since the 1940s, perhaps due in part to a general increase in winds in the upper-levels of the atmosphere. Overall, storm frequency over time has decreased, and storm tracks have shifted towards the poles. However, some researchers have found that the decreases are primarily in weak to moderate-strength storms, while high intensity storms are becoming more frequent. Maximum significant wave heights (the average of the highest one-third of waves, as measured at NOAA buoys) increased from about 9 meters in the 1970s to about 12 meters by 2005. In addition, the aspect of waves has changed, partly due to altered storm tracks. In Oregon, waves have become more southwesterly than normal, increasing erosion and further altering the redistribution of sand (see below). These three trends (higher intensities, more frequency, and changed direction) will further tax infrastructure and require additional efforts to protect the waterfront areas of coastal communities in Oregon and elsewhere in the Pacific Northwest. Two coastal phenomena, summertime coastal upwelling and periodic El Niño events may combine forces to exacerbate the destructiveness of Oregon’s winter storms in the future by raising mean sea level during winter months. Upwelling is an ocean process that provides nutrients that support Oregon’s fisheries. It occurs when strong late-spring and summertime north winds cause coastal ocean surface water to flow southward. The earth’s rotation shifts that southerly flow to the west which brings dense, cold, nutrient-rich deeper ocean water to the surface all along the continental margin. Because this deep oceanic water is relatively cold, and since upwelling events typically occur during summer, water temperatures along the coast are often warmest during winter when upwelling doesn’t occur. This warmer water is less dense (and thus occupies a greater volume) leading to higher wintertime sea levels compared to summertime levels. El Niño events, which tend to occur every two to seven years, cause broad changes in the wind regimes over the Pacific ocean resulting in sometimes dramatic changes in Pacific weather patterns. Strong El Niño events in Oregon are generally characterized by drier conditions, warmer temperatures, and lower precipitation and streamflow (e.g., 1991 and 1993 El Niños), but El Niño events can also result in greater winter storminess and flooding (e.g., winter 1982-83 and 1997-98). The combination of upwellings and El Ninos suggests that periodically the Oregon coast is subjected to intense storms and large waves when sea levels are at their highest. Factors in sea level rise with predicted increases in winter storm frequency,intensity, and greater wave sizes and you have the potential for increases in the frequency and intensity of coastal flooding and erosion. Alternations in El Niño effects also contribute to wave-induced sand transport. During “normal” El Niño years, sand is transported north along the region’s beaches during the winter in equilibrium with the southerly transport during summer. In recent years, however, the balance has tipped toward northerly transport, with the result of increased erosion at the south end of beaches and jetties in coastal Oregon. In some coastal locations, such as Neskowin, Oregon, erosion problems begin during strong El Niño winters and shorelines continue to deteriorate after the El Niño has ended. There is no present consensus on whether El Niño probability is increasing with climate change, but when winter and summer water levels are analyzed separately, the rate of sea level rise is higher and more variable during winter. These changes are most apparent during El Niño events, and managers and residents alike are advised to consider El Niño in hazard assessments for the Pacific Northwest and coastal Oregon. 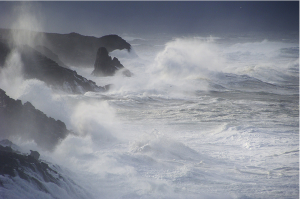 El Niño and other climate and ocean processes are described more fully at Oregon State University reports. Climate change may have significant local effects on estuaries, the transitional areas between marine and freshwater habitats. Estuaries represent some of the most valuable and important habitats of this region: for example, more than 75 percent of all commercial fish and 80 to 90 percent all recreational fish and shellfish in continental U.S. are dependent on coastal wetlands for at least part of their life cycle (National Safety Council’s Environmental Center 1998). Changes in local precipitation and delivery of freshwater inputs, tidal inundation, sea level rise, upwelling, storm intensity, wave size/energy, and water chemistry all have potential to alter and affect the services provided by estuaries (Table 1). These physical changes can affect estuarine communities in myriad ways: they can change the distribution, growth, and reproduction of organisms and the vegetation communities that form the base of the estuarine food web and provide structure to estuarine habitats. The degree to which these interactions are changing is highly uncertain, however, the OCCRI report summarizes the present understanding of these changes (Table 1). Table 1. 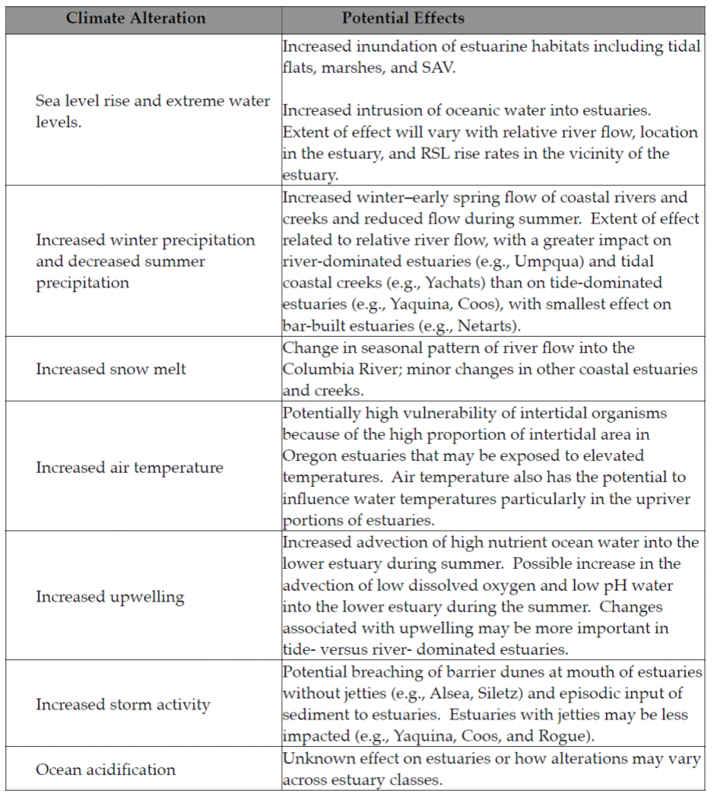 Hypothesized climate change effects on Oregon’s estuaries (OCCRI 2010). While it is difficult to separate climate-driven changes in water quality in Oregon’s estuaries from the regular suite of human activity-driven changes, models of the Columbia River estuary conducted by the Center for Coastal Margin Observation and Prediction suggest a high degree of “non-linearity” in estuarine responses to climate drivers. In other words, relatively small, incremental changes in coastal climate can cause large changes in water quality and associated plant and animal populations. During the wet season in the Pacific Northwest (November-April), estuaries are generally freshwater-dominated as stream and river flows increase during this period of greater precipitation; while in the dry season (May-October, roughly coinciding with upwelling periods), estuaries are more marine (salt water)-dominated as freshwater inputs are reduced to a minimum. Such duality contributes to estuaries’ vulnerability to climate change, particularly since estuarine organisms are adapted to specific ranges of air and water (both river and ocean) temperatures. In Oregon estuaries, monitoring efforts show that steep temperature gradients form during the dry season, with temperatures lower at the estuary mouth and higher where freshwater enters the estuary from rivers and streams. Climate change-driven temperature increases, altered precipitation and river discharge patterns, sea level rise, and changes in upwelling (contributing cold oceanic water intrusions into estuaries) can increase the variability present in the estuary. Tolerances of some organisms in these changing environments may be sorely tested and community composition and functionality may change. The South Slough Reserve has monitored water quality and other environmental variables in South Slough estuary since 1995. One surprising pattern is that pH has increased over time in the Slough in spite of a general decline in pH in the greater Pacific Ocean (see Water Quality: Abiotic, Nutrients and Bacteria in South Slough in this document). While the reasons for South Slough’s trend in pH is unclear and will be the subject of future research, ocean acidification is a phenomenon that has increasingly alarmed the scientific community and shellfish growers worldwide, as lowering pH threatens the ability of shellfish to form shells. Other trends in South Slough show that that local-scale variability in dissolved oxygen levels reflects the Pacific Decadal Oscillation (PDO; O’Higgins and Rumrill 2007). The PDO is an index based on Pacific-wide warming and cooling changes in sea surface temperature that shifts back and forth over a 20-30 year period (Mantua 2002). The amount of dissolved oxygen that can occur in water is dependent on its temperature, and all other things being equal, there will be less dissolved oxygen in warmer waters. Links between the PDO and climate change are as yet undetermined, although some models show similarities between climate change effects and the PDO cycles (Mantua 2002). Nutrient levels in estuaries will also likely vary with climate change. Increased tidal inundation may allow nutrient-rich oceanic water to intrude further into estuarine environments. Likewise, increased precipitation may allow nitrogen from terrestrial sources to increase along with river discharge. An overabundance of nutrients in estuarine and nearshore ocean waters can cause problems, resulting in “dead zones” where large quantities of decomposing organic material generated in nutrient-rich waters depletes the dissolved oxygen supply in those waters (e.g., Diaz and Rosenberg 2008). In estuarine wetlands, Deegan et al. (2012) recently showed that increased nutrient levels can result in the breakdown of the physical structure of salt marsh tidal channels, leading the way towards their overall degradation. Emergent tidal marsh habitats—essential for a myriad of plant and animal species, including juvenile salmon in marsh channels—are also vulnerable to climate change effects. Modeling efforts in Oregon using the Sea Level Affecting Marshes Model (SLAMM) show that marshes such as Bandon Marsh in the Coquille estuary stand to lose from 19-92% of marsh area by the year 2100, depending on the sea level rise scenario considered by the model (Clough and Larson 2010). However, data needed to effectively use the model (marsh surface elevation and sediment accretion rates), are lacking for many emergent wetlands. Furthermore, the SLAMM model is unable to factor in changes in sediment accretion rates (Clough and Larson 2010). Studies from other regions of the U.S. suggest that tidal marshes may increase sediment accretion rates as sea levels rise, keeping pace with changing sea levels, assuming there is an adequate sediment supply. They also note that sedimentation rates will not keep up with sea level rise when the rate of sea level rise exceeds a certain threshold (Baustian et al. 2012, Mudd et al. 2009, Morris et al. 2002). In the event that local rates of sea level rise exceed the sedimentation rates of local estuarine marshes, those marshes may be able to migrate inland horizontally to newly tidal areas if there’s adequate room. However, because shoreline topography frequently limits this migration, there is a general assumption that some marsh communities may disappear or become diminished resulting in ripple effects that will tax both marine and freshwater resources in coastal ecosystems. Climate change will present new challenges in understanding the dynamics of fish distribution and abundance, and as such may have substantial economic and cultural effects. There will be both winners and losers among fishes and fisheries as Oregon’s ocean warms and acidifies. In general, as ocean waters warm over the next century, the distribution and abundance of locally familiar fish species are expected to change. Fish species distributions are expected to shift northward into cooler waters. Cool-water species may also move to deeper, colder waters. Abundances of warm water species are expected to increase while cold water species decline. But this does not mean that the overall numbers of marine fish species will decline off the Oregon coast. The coastal area with the most diverse fish species assemblage has historically been off the US-Mexican border where warm and cold water fish species mix. As the ocean warms, the trend will be for that high species diversity mixing zone to move northward, likely resulting in a net gain of species here as more warm water species move into our area than cold water species move out. 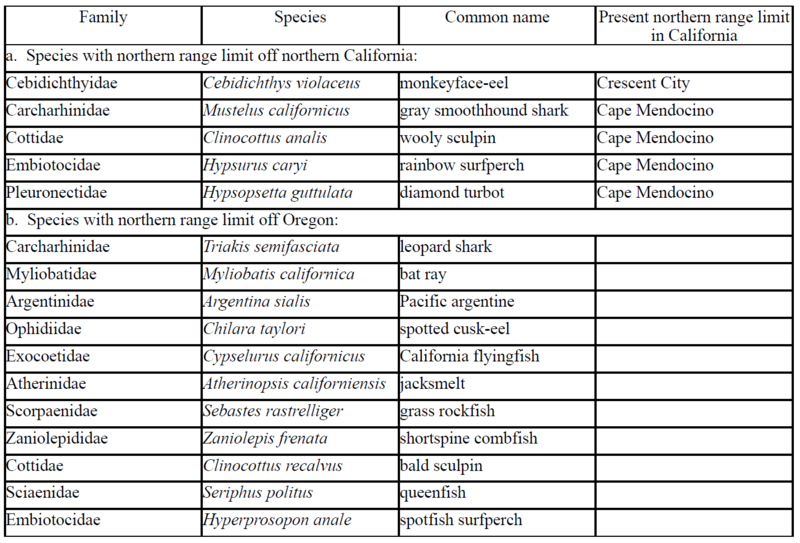 Table 2 lists five possible California nearshore fish species that may immigrate to Oregon waters (their present northern range limits are between Cape Mendocino and Crescent City). Table 2 also lists 11 other nearshore fish species that have current northern range limits along the Oregon coast that may become more abundant off Oregon as ocean waters warm, assuming water temperature is the primary factor limiting northern distribution limits. Table 2. (a) Nearshore California marine fishes whose present northern range limits are off northern California (between Cape Mendocino and Crescent City). These species are possible candidates for range extensions into Oregon waters as the ocean warms. 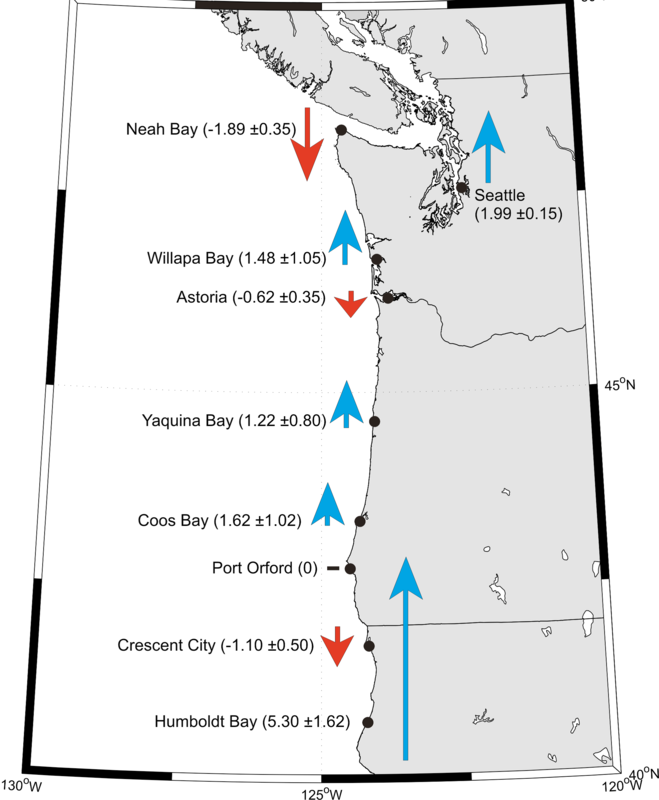 (b) Nearshore marine fishes whose present northern range limits are off Oregon. These species are possible candidates for increasing abundance in Oregon waters as the ocean warms (OCCRI 2010). While fish species abundance may increase off the Oregon coast, our region has already seen both positive and negative effects of ocean warming. For example, from 2003 to 2006, the ocean was so warm that many Sacramento River fall Chinook salmon—major contributors to the Oregon and northern California salmon fisheries—failed to thrive. The adult Chinook salmon population fell so low that the fishery was closed coast-wide during 2008 and 2009, when those adult fish would have become available to catch. On the other hand, due to coastal ocean warming, albacore tuna (Thunnus alalunga), another commercially important and growing fishery, now occurs closer to shore than at any time since the 1970s. Climate models confirm that that ocean conditions will become increasingly unfavorable for salmon off Oregon while improving for warm-water species. While the migration of warm-water species northward along the Oregon coast may benefit local fisheries, chances are salmon abundance from Oregon to Alaska will decline during this century as warming affects their food supplies. Surface-dwelling salmon species such as coho salmon and steelhead trout are particularly expected to decline. Ocean acidification may affect fishes, although recent studies suggest fish may be more tolerant of increasing acidity compared to many invertebrates (Kroeker et al. 2010). In general, smaller, faster-growing, shorter-lived species are expected to adapt more rapidly to climate change than larger, slower-growing, longer-lived species. In addition to ocean warming and acidification, the effects of climate-related changes in currents, food availability, disease, predators and competitors may also affect marine fish species distribution and abundance. For example, the large and fast growing warm water species, Humboldt squid (Dosidicus gigas)—a voracious fish predator that includes Pacific salmon and Pacific hake in its diet—first appeared off the Oregon coast during the 1997 El Niño and has since been observed as far north as southeastern Alaska. Since the squid migrated northward, the abundance of Pacific hake (also known as Pacific whiting, Merluccius productus) has been negatively correlated with the abundance of Humboldt squid. As Pacific hake comprise the largest volume of fish caught commercially off the Oregon coast, the presence of the Humboldt squid represents a likely climate-related change for an Oregon fishery. However, the change may be short-lived since squid abundance is expected to be affected by another climate-related change: ocean acidification is expected to cause Humboldt squid populations to decline over time. Oregon’s fisheries, and fishing income, are not restricted to the Oregon coast. 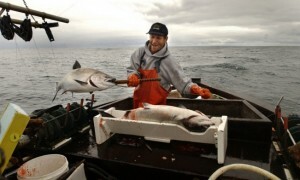 Landings in Oregon of marine fish captured in Alaskan waters were valued at about $1.4 million during 2002–2009. There were 271 Oregon fishing vessels working off Alaska in 2008, and Oregon residents grossed over $104 million from Alaska commercial fisheries that year (Norman et al., 2007) . This link between Oregon and Alaska fisheries is relevant because arctic and subarctic marine ecosystems are warming and changing much more rapidly than anywhere else in the world’s oceans. These distant impacts will undoubtedly affect Oregon’s economy. Oregon’s forests have responded many times over tens of thousands of years to shifting climate by changing the distributions and associations of plant species. Recent research and computer simulations indicate that changes in western Oregon forest over the past century (such as earlier flowering dates for some plant species and increased tree mortality in some old-growth forest stands), can be attributed to the changing climate, that changes occurring since the mid-1970s have been relatively large and rapid, and that these changes will continue at an increasing rate over the next century. The frequency and magnitude of some disturbance events such as wildfires, droughts and insect outbreaks may be also changing. Large wildfires, such as the 2002 Biscuit Fire in southern Oregon and northern California that burned 500,000 acres, could become increasingly common in Coast Range forests, though it is unclear whether this threat also extends to the fog zone along the Oregon coast, including the forests in the Partnership project area. Genetics and vegetation life-cycle characteristics will play important roles in determining how forests respond. 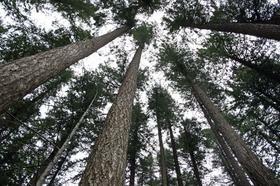 Changes are projected to occur rapidly relative to the long life cycles of many Oregon tree species, making it difficult for them to adapt genetically or to disperse to areas of more suitable climate. Long life cycles also limit managers’ ability to adapt their strategies to assist plants in coping with the effects of climate change. Except for commercially important species such as Douglas fir (Pseudotsuga menziesii), we know little about the sensitivity of many plant species to the effects of climate change, their responses to insect infestations, disease, or invasions of exotic plants or animals, or how invasive species will affect wildfire patterns. While uncertainty limits our ability to predict the response of forests to climate change, the potential for regional, multi-year drought is of particular concern. Some species may become more efficient at using water with increased levels of carbon dioxide in the atmosphere, which could be critical to their ability to withstand drought. As our knowledge and understanding of climate change, plant species, and forest ecosystems improves, we will be better able to simulate the response of forests to climate change. While challenges to infrastructure such as jetties, dikes, seawalls, and shoreline structures abound in most climate change scenarios, the projected drier summers may enhance travel and recreational opportunities in the Pacific Northwest and coastal Oregon. However, facilities dedicated to visitor services may be impacted by both climate change and increased visitor use. Consideration of community growth and development should be incorporated in regional planning efforts as residents plan and adapt. Projecting future hazards for the Oregon coast and the Pacific Northwest is daunting because of the complexity of these natural systems and the unknown magnitude at which conditions are changing. Modeling such complexity is resource-heavy and has yet to be applied to the Oregon coast. However, researchers are presently developing hazard models for Oregon by considering variables such as total water levels, deep water wave height and period, tidal fluctuations and magnitudes, retreat of fore-dunes, and variable erosion of the coastline. Intensive study of the erosion and flooding that have been impacting communities, such as Neskowin, in the past decade provides a glimpse of what other Oregon coastal communities may expect in the future; Oregon’s costal residents are well-advised to follow suit, taking immediate steps to assess their own community’s vulnerability and create an adaptation plan. Allan, J.C. and P.D. Komar. 2006. Climate controls on US West Coast erosion processes. Journal of Coastal Research 22(3):511-529. Baustian, Joseph J. and I.A. Mendelssohn, M.W. Hester. 2012. Vegetation’s importance in regulating surface elevation in a coastal salt marsh facing elevated rates of sea level rise. Global Change Biology. 18:3377–3382. Clough, J.S. and E.C. Larson. 2010. Application of the Sea-Level Affecting Marshes Model (SLAMM 6) to Bandon Marsh NWR. Prepared for the U.S. Fish & Wildlife Service, National Wildlife Refuge System, Division of Natural Resources and Conservation Planning, Conservation Biology Section, Arlington, VA by Warren Pinnacle Consulting, Inc., Warren, VT. 69 pp. Deegan, Linda A., and D.S. Johnson, R.S. Warren, B.J. Peterson, J.W. Fleeger, S. Fagherazzi, W.M. Wollheim. 2012. Coastal eutrophication as a driver of salt marsh loss. Nature. 490:388-392. Diaz, R.J. and R. Rosenberg. 2008. Spreading dead zones and consequences for marine ecosystems. Science 321:926–929. Graham, N.E. and H.F. Diaz. 2001. Evidence for intensification of North Pacific winter cyclones since 1948. Bulletin of the American Meteorological Society 82:1869-1893. Komar, P. D., J. C. Allan, and P. Ruggiero. Sea level variations along the US Pacific coast: tectonic and climate controls. Journal of Coastal Research (in press). Kroeker, K. J., Kordas, R. L., N, C. R. & Singh, G. G. 2010. Meta-analysis reveals negative yet variable effects of ocean acidification on marine organisms. Ecol. Lett. 13, 1419-1434. Mantua, N.J. 2002. “Pacific-Decadal Oscillation (PDO).” Pp. 592-595 In: MacCracken, M.C. and J.S. Perry (eds.) Encyclopedia of Global Environmental Change. (Chichester, UK: John Wiley & Sons). Morris, J.T. and P.V. Sundareshwar, C.T. Nietch, B. Kjerfve, D.R. Cahoon. 2002. Responses of Coastal Wetlands to Rising Sea Level. Ecology. 83(10):2869–2877. carbon accumulation, Estuarine, Coastal and Shelf Science, 82(3): 377-389. Norman, K., J. Sepez, H. Lazrus, N. Milne, C. Package, S. Russell, K. Grant, R.P. Lewis, J. Primo, E. Springer, M. Styles, B. Tilt, and I. Vaccaro. 2007. 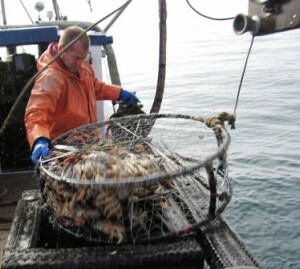 Community profiles for West Coast and North Pacific fisheries–Washington, Oregon, California, and other U.S. states. U.S. Dept. Commer., NOAA Tech. Memo. NMFS-NWFSC-85, 602 p.
O’Higgins T. and S. Rumrill. 2007. Tidal and Watershed Forcing of Nutrients and Dissolved Oxygen Stress within Four Pacific Coast Estuaries: Analysis of Time-Series Data collected by the National Estuarine Research Reserve System-Wide Monitoring Program (2000-2006) within Padilla Bay (WA), South Slough (OR), Elkhorn Slough (CA), and Tijuana River (CA). Project Report NOAA/UNH CICEET. pp 1-58.